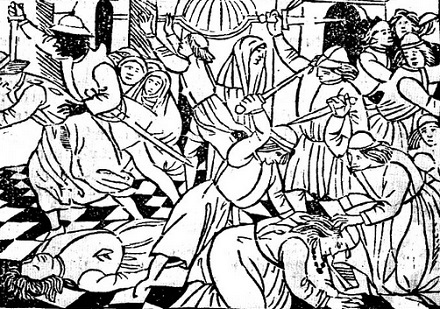 On this date in 1418, the Duke of Milan annulled his marriage at the headsman’s block. Beatrice (English Wikipedia entry | Italian) was initially the wife of the condottiero Facino Cane, a brutal but successful warrior who gained de facto control of the Duchy of Milan when it was inherited by a teenage Duke. 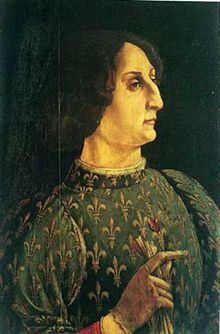 That teen’s younger brother, Filippo Visconti, spent the early 1400s packed away in Pavia, sickly and marginal, wondering which of the deadly machinations of state playing out above him might unexpectedly come crashing down on his own head. It seems doubtful that Beatrice ever had reason to give the little twerp a thought. Delivery for Filippo came in May 1412. Big brother was assassinated while Facino Cane lay dying and suddenly the 19-year-old called the shots in Milan. In his day, he would become known as a cunning and cruel tyrant, and would make Milan the dominant power in northern Italy. 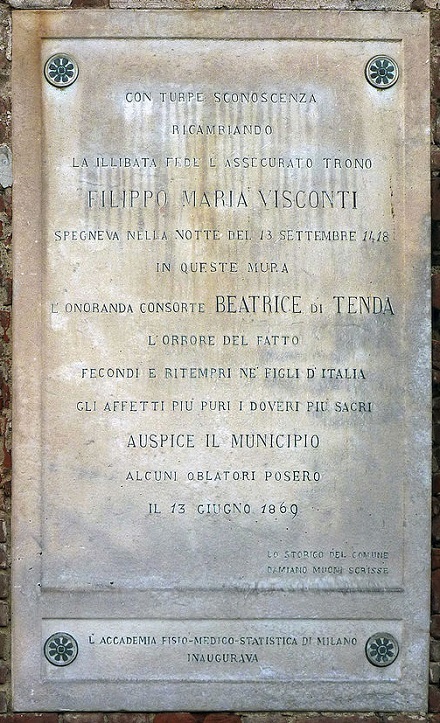 And it all was possible because of May 1412, which not only elevated Filippo but widowed our principal Beatrice. From her puissant late husband she inherited 400,000 ducats and huge … tracts of land. Her virtues could hardly fail to appeal to the whelp of a Duke, even at twenty years his senior; indeed, it was Cane himself who sketched out this succession plan from his deathbed. It seems, however, that having taking possession of the wealth and legitimacy that came with Beatrice’s hand, Filippo soon grew irritated with the rest of her — enough so that he at last determined to put her aside. His paranoid Excellency wasn’t the quietly-retire-you-to-a-monastery type; instead, he went for the full Anne Boleyn. 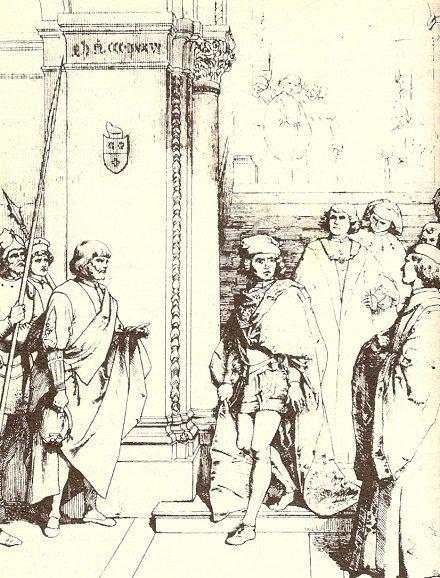 Accusing his consort of consorting with a young troubadour in her court, Michele Orombelli, Filippo had the accused cuckolder and two of Beatrice’s handmaidens tortured until they produced the requisite confession/accusation of faithlnessness. Upon that basis he had Orombelli and Beatrice di Tenda both beheaded at the castle of Binasco. A plaque placed there to commemorate the spurned wife is still to be seen today. Bellini’s second-last opera was based on this tragic story. 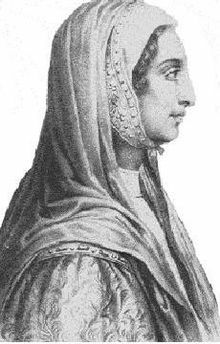 Beatrice di Tenda premiered in 1833; it’s noteworthy in Bellini’s biography because deadline disputes in its composition ruined the composer’s longstanding collaboration with librettist Felice Romani.